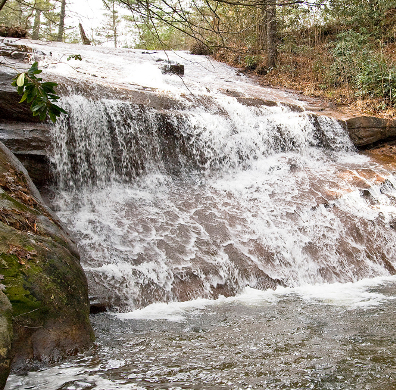 Western North Carolina Mountain creeks and streams are famous for having some of the best trout waters on the East Coast. Come and stay just South of Asheville and enjoy the peaceful waters during the day and relax in one of our homes in the evening. We offer great rates and have cabins and cottages or a luxury home to suit all your needs. The most famous is The Davidson River which can be reached from some of our homes in as little as five minutes and from all within 15 minutes. If you are looking for challenging fly-fishing, this river has all the right components. Located in Transylvania County, just west of Brevard, the Davidson ranges in size from a medium-sized creek to a floatable river. The river includes a catch and release, fly-fishing only section and holds some trophy trout for the experienced angler. Most of these fish are very accustomed to fishermen as well as the flies they try to pawn off as naturals. General patterns typically do not produce, though presentation is certainly more important to these educated fish. Accessibility is not limited, as parking is available on the roadside at consistent intervals. This area also includes one of the state’s fish hatcheries and a wildlife education center. Included in Orris’s ranking as one of the top 100 trout streams in the country. Spectacular hatches occur here in the warmer months. So pick up the phone today and call Deer Ridge 828-862-8134 and organize a fly-fishing trip in the NC mountains. We will also help you connect with local guides who have the inside knowledge of all the best fishing spots. The two main outfitters that operate in the area are Davidson River Outfitters and Headwaters Outfitters.